← Patriotism … with lasers! Summer road trips have been a part of the Southern landscape since rednecks first discovered their Riviera on the shores of the Gulf of Mexico. For nearly as long, parents have been looking for ways to entertain their children in the car on the way to the beach. We’re just past Independence Day, and my family has already made one long and several short car trips. All the time behind the wheel has me contemplating how kids pass the time in the car in the New South. When I was growing up, my family made annual treks from Fort Worth, Texas, to Columbus, Ga., to see my grandparents. Not confined to car seats like today’s kids, my two brothers and I freely roamed the back seats of our family’s station wagons and sedans. We amused ourselves with books, coloring books and handheld, battery-operated electronic games, which were the new technological rage in the late 1970s. We counted “Lovebugs” and cried out in olfactory offense when we passed a nearby paper mill. We enjoyed egg McMuffins and Whoppers, and occasionally stopped at Stuckey’s when traversing Mississippi. 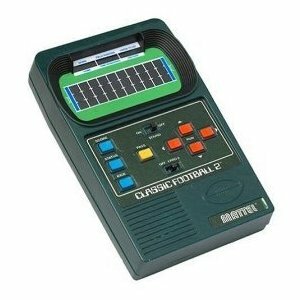 Mattel's Football 2 was our favorite. You could even "pass" indicated by one red blip blinking and moving downfield to another red blip. Highly advanced for its day. Kids in the New South, spend car trips watching movies, listening to MP3 players and playing handheld game systems like Nintendo DS and Playstation PSP. These game systems allow kids to play interactively in high resolution graphics. Back in my day, we tried to move a red blip past other red blips in a game that sounded like Morse Code and resembled a malfunctioning Internet router more than it did football. 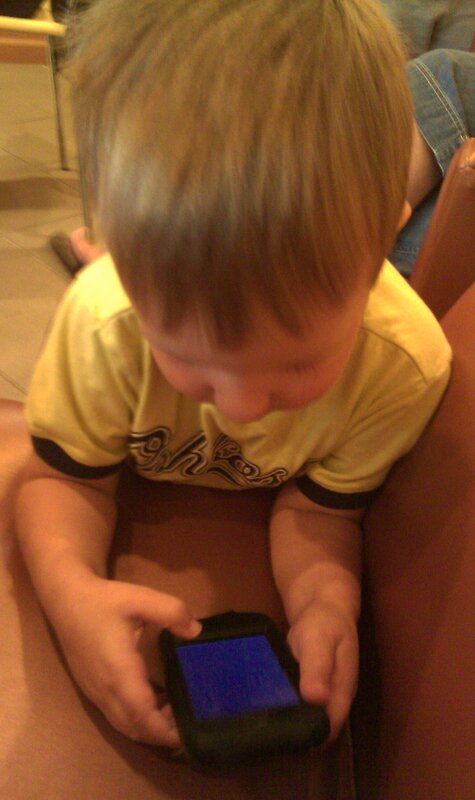 Our 2-year-old son, Carlton, demonstrated a new breakthrough during a recent trip to Tampa. As all 2-year-olds confined to car seats for long periods do, Carlton began to fuss and whine and lose interest in the movie my older two boys watched on our minivan’s built-in DVD player. My wife clicked away on Facebook on her ever-present iPhone attracting Carlton’s attention. “I want it!” he whined, arms outstretched. Tough love isn’t something we practice during long car trips. Carla handed over her phone, and in just a few seconds we heard Barney singing “The Wheels on the Bus.” Carla and I exchanged puzzled looks. She took the phone away, reset it and handed it back so she could see what he was doing. Carlton outsmarts the smart phone. Unable to read but not immune to good branding, the 2-and-a-half-year-old Carlton scrolled through the apps until he found Netflix. After he hit the Netflix button, he immediately found “Barney & Friends” among the “recently watched” options. He clicked it, resuming Barney in mid-chorus. I get that kids pick up technology quickly. I get that the iPhone is easy to use. What is a little hard to fathom is how quickly we went from counting state license plates and Volkswagen Beetles to playing DVDs and streaming children’s TV shows on our smartphones. With one more car trip to go, my faithful readers as my witness, if I hear the words “I’m bored” I’m going to lose it. Here’s hoping Carlton’s fascination with Barney and friends holds up for a few more hours, and Carla’s data plan doesn’t give out. This entry was posted in Uncategorized and tagged Barney, car trip, Iphone, Lance Elliott Wallace, Lance Wallace, minivan, Netflix, New South, New South Essays, NewSouth, Nintendo DS, Playstation PSP, road trip, smartphone, Southern, Southern Culture, Stuckeys, Volkswagen Beetle. Bookmark the permalink.